EKF Diagnostics, the global in vitro diagnostics company, announces that a recent study has confirmed that its Quo-Test® A1c point-of-care testing (POCT) analyzer shows comparable performance to a lab-based HPLC system for the measurement of glycated hemoglobin (HbA1c). Recently published in Practical Laboratory Medicine , the study undertaken by the Diabetes Research Unit Cymru, Swansea University, UK, also observed that under the correct circumstances using WHO guidelines Quo-Test is appropriate for the diagnosis of Type 2 diabetes. HbA1c is routinely used as a measure for the assessment of long-term diabetes control and, more recently, it has also been recommended for diabetes diagnosis . With the increasing use of POCT devices for the measurement of HbA1c without the waiting time associated with laboratory testing, it is crucial to determine how their performance compares. The Swansea University study aimed to compare the Quo-Test POCT analyser using boronate fluorescence quenching technology with an established HPLC laboratory method. Using whole blood EDTA samples (n=100) from subjects with and without diabetes, the study found good overall agreement between the Quo-Test and reference HPLC method (R2=0.9691; p<0.0001). A diagnostic comparison was also made in line with WHO diagnostic ranges for HbA1c. Use of the Quo-Test as a diagnostic tool, showed 97% (n=79) agreement with the HPLC analyser for glucose intolerance and 100% (n=72) agreement for Type 2 diabetes. The Diabetes Research Unit Cymru study follows another by scientists from the European Reference Laboratory for Glycohemoglobin . This demonstrated that Quo-Test A1c easily met International Federation of Clinical Chemistry and Laboratory Medicine (IFCC) performance criteria for HbA1c measurement. Meeting the IFCC accepted quality targets (>2 sigma at 10% total allowable error (TAE) at 48 mmol/mol HbA1c) is essential for the effective monitoring of glycemic control in diabetes patients. 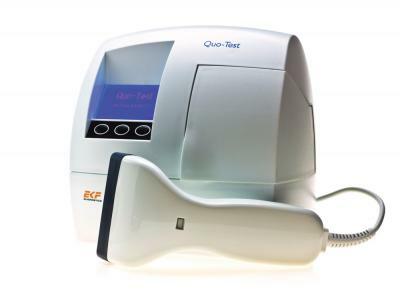 EKF’s Quo-Test analyzer has been designed for easy and reliable HbA1c measurement in a point-of-care setting, such as diabetes clinics and doctors’ surgeries. It is fully automated, measuring glycated hemoglobin from a 4 μL sample taken from a finger prick or venous whole blood. Sample results are available within four minutes and reported in IFCC and DCCT standard units. It is also unaffected by most hemoglobin variants.